Movie Review: Based on true events, “Lone Survivor” tells the ill-fated story of four soldiers, members of Navy-SEAL Team 10, who went to Afghanistan’s Kunar Province with the mission of capture/kill a dangerous Taliban leader. The 2005 mission known as ‘Operation Red Wings’ was a complete failure, and only Marcus Lutrell, performed without great brilliance by Mark Wahlberg, escaped with life from the hellish mountains populated with numerous and ferocious Taliban who came out from all directions. The troubles arise when the team loses communication with the base, after has accidentally bump into two youths and an elder Taliban, deciding to release them afterwards as a good practice conduct. Peter Berg (“The Kingdom”, “Hancock”) was able to depict the soldiers’ despair and bravery in a raw manner, capturing some beautiful images among the devastating scenarios of war, but the film loses some grip as the story reaches its final part. I think those final minutes took the film to where I didn’t want to, sweeping some of the good thing it had done till there. Even so, this terrifying journey is worth watching, and for several occasions I felt this nightmare as if I was there in the middle of the mountains, witnessing my companions dying little by little. 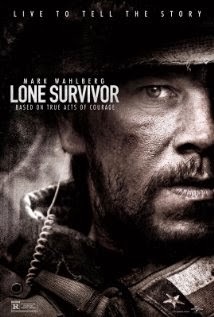 Far from essential, “Lone Survivor” shall please war genre fans, serving simultaneously to reinforce that this conflict shouldn't be against a country and its people, but against its fanatic minority factions.